Originally published under the title, "West Misses Point—and Lesson—of Buddhist Anti-Muslim Sentiment." Ongoing reports decrying "anti-Muslim" Buddhists seem to miss the point: this antipathy did not appear out of thin air but rather in response to Islamic aggression—the same Islamic aggression the rest of the world is trying to cope with. A Financial Times editorial titled "Buddhist militancy triggers international concern" opens by describing the "traumatic first-hand view" of a Muslim woman whose home was attacked and possessions plundered by Buddhists in Sri Lanka. Says the woman: "If I could meet those responsible, I would ask: 'Sir, does your Lord Buddha teach this?'" Some paragraphs down, readers discover that her home was attacked during the course of "two days of clashes with Muslims," which were "sparked by a street-corner disagreement between a Buddhist monk and a young Muslim," and which left three people—religious identity unstated—dead. As in other countries, Muslim minorities in Buddhist nations often initiate violence and mayhem. But FT does not allow for that interpretation, arguing instead that the incident "is part of a wider trend: the rise of a new generation of militant anti-Muslim Buddhist organisations." At no point does the editorial point out that Muslim minorities regularly provoke Buddhist backlashes. An Al Jazeera report titled "Myanmar's Buddhist terrorism problem" cites major clashes that erupted in May 2012 and which displaced numerous Muslims. But, as one digs further, one realizes that these clashes were sparked after Muslims raped and slaughtered a Buddhist woman. Ashin Wirathu, a Buddhist monk with a rock-star following in Myanmar, sat before an overflowing crowd of thousands of devotees and launched into a rant against what he called "the enemy"—the country's Muslim minority. "You can be full of kindness and love, but you cannot sleep next to a mad dog," Ashin Wirathu said, referring to Muslims. "I call them troublemakers, because they are troublemakers." For thousands of years my country (Indonesia) was a Hindu Buddhist kingdom. The last Hindu king was kind enough to give a tax exempt property for the first Muslim missionary to live and to preach his religion. Slowly the followers of the new religion were growing, and after they became so strong the kingdom was attacked, those who refused to become Muslims had to flee for their life to the neighboring island of Bali or to a high mountain of Tengger, where they have been able to keep their religion until now. Slowly from the Hindu Buddhist Kingdom, Indonesia became the largest Islamic country in the world. If there is any lesson to be learnt by Americans at all, the history of my country is worth pondering upon. We are not hate mongering, bigoted people; rather, we are freedom loving, democracy loving and human loving people. We just don't want this freedom and democracy to be taken away from us by our ignorance and misguided "political correctness", and the pretension of tolerance. (Source: Facing Islam, endorsement section). 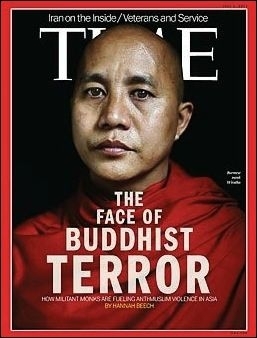 Accordingly, Wirathu, the "radical" Buddhist monk cited by FT, NYT, and Al Jazeera—the latter simply calls him the "Burmese bin Laden"—is on record saying: "If we are weak, our land will become Muslim." The theme song of his party speaks of people who "live in our land, drink our water, and are ungrateful to us"—a reference to Muslims—and how "We will build a fence with our bones if necessary" to keep them out. His pamphlets say "Myanmar is currently facing a most dangerous and fearful poison that is severe enough to eradicate all civilization." To this, the NYT scoffs, pointing out that "Buddhism would seem to have a secure place in Myanmar. Nine in 10 people are Buddhist… Estimates of the Muslim minority range from 4 percent to 8 percent." As mentioned, however, in neighboring Thailand, Muslims also make for about 4% but are engaged in widespread violence against Buddhists in the south where Muslims are concentrated. More importantly, history—true history, not the whitewashed versions currently peddled in American schools—demonstrates that for 14 centuries, Islam has, in fact, wiped out entire peoples and identities: what we today nonchalantly refer to as the "Arab World" was non-Arab and almost entirely Christian in the 7th century, when Islam came into being and went on the jihad. Today, Christians remain a persecuted and steadily dwindling minority. If Buddhists understand that their entire civilization is at stake, the FT, NYT, and of course Al Jazeera editorials carry all the trademarks—moral relativism and pro-Islam bias, and that dangerous mixture of confidence and ignorance—that characterize the Western elites' inability to acknowledge, let alone respond, to Islamic aggression.